Maisie started working in a small animal first opinion practice in 2012 and qualified as an RVN in 2015. She started at SCVS in 2016 as a rotating nurse and after developing a keen interest in neurology, she joined the neuro team full time later that year. 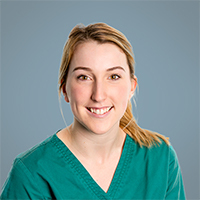 Maisie particularly enjoys working in the neuro department due to the complex anaesthesia cases and in 2017 she completed the ESVPS nursing certificate in anaesthesia.